Effortless, classy, and independent–the woman of today is as dashing as any man, and so much more. for Philippine Fashion Week Holiday 2016. 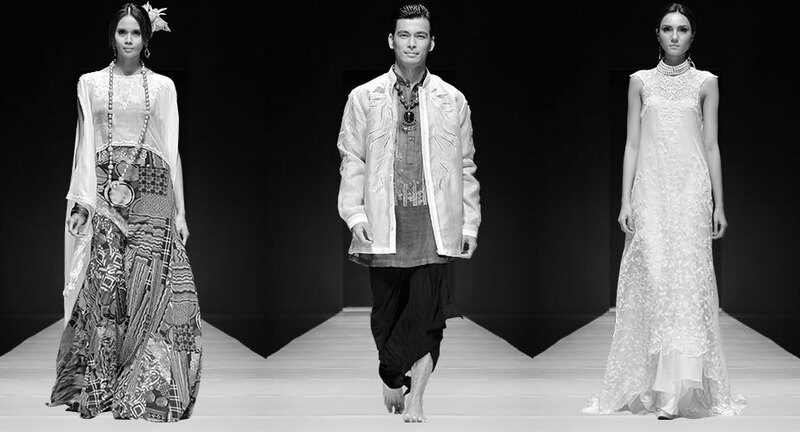 A tribute to Philippine Tribes — its culture, art and fabrics. Jeffrey Rogador x Power Mac Center’s The Coop Idea for Philippine Fashion Week Holiday 2016. Peace is elusive–shifting, diverse. To hold on to it, there must be fusion. PHILIPPINE FASHION WEEK UNVEILS HOLIDAY 2015! special bonus attraction: PhFW Spring Summer 2015 video! Q: What were you thinking of when you were designing your collection? Pat Santos (PS): Women… and their fantasies. I’d like women to wear my clothes as their day-to-day or day-to-night clothes. Q: Why was this the idea that came out of the collection? PS: Colors. I wanted to keep in mind the skin-tone of the Filipino, so I thought of the different shades of blue. There’s navy blue, tourquoise, mint green, aqua, and royal blue. I think these colors are one of the shades that match with Filipina skin tones. Q: How about the flowers? PS: Flowers because it’s spring summer. I wanted to add softness versus the structure of the garments. Q: What’s the title of your collection? Q: What’s the theme of this particular collection? What’s your personal favorite piece in your collection? PS: My favourite pieces were the dresses—especially the A-line, the little neoprene dresses. It makes a person look longer, especially Filipinas. Q: Why do you think these types of designs will be ideal to the warmer months of the summer? PS: I think it’s very summer first and foremost because of the colors. And then the cuts, it’s more on halters, so it’s not so hot, and works well in tropical climates. The different types of backless dresses, and chiffon pieces, they can use for parties. Q: What was the response you have been receiving from the public? Your patrons? How does it make you feel? PS: Everything was positive, they want to wear the clothes, and buy the clothes. The ones who saw it already want to see the next collection. They’re mostly happy with the range that they saw; some were even surprised because the colors were so alive. My customers and patrons really liked the pieces, some even wanted the pieces translated in different colors. Others already ordered to wear it to parties. I think my patrons really loved the blocking, like the blue corded monochrome lace. My buyers also loved the white ones, saying they looked so fresh and clean. Q: Can you give us tips for the people who will wear your pieces? Give us styling / accessories tips, recommend hair and make-up styles that you think will be perfect for your collections. PS: The people who wear my clothes first and foremost have to think about their personality. They don’t need to pretend; the clothes will really speak for themselves. The clothes I made are entitled for all occasions—for resorts, out of town; you can also wear it at night for parties. You can wear it to the office; just throw a jacket or blazer over it. For accessories, not too much—because the clothes are embellished and multi-colored. For hair and makeup, actually, relaxed and clean hair and look. No-makeup looks to keep it from clashing with the colors. Q: Why do you like the summer? How different is designing Spring Summer Collections from Holiday Collections? PS: Actually, both seasons are challenging. Summer, it’s more lightweight. Colors are not so dim, pastels; lighter and brighter. Unlike holidays, it’s a party season so we bring the collections to jewel and gem tones, we bring it to the deeper palettes. Holiday collections are a little more formal with embellishments too. Q: How will your clothes make people look and feel good? PS: Definitely they will look good, because their feeling really depend on their confidence. Even if you wear the best clothes, if you’re not confident in yourself, there’s nothing. Q: Why are the clothes you make the way they are? What inspires you to make the kind of clothes you make? PS: Number one, people don’t need to be pretentious when they wear my clothes. Second, they have to be confident enough to dress up, with all the aesthetics that I create. What inspires me is how people appreciate the clothes I make. Say, I come out with an idea, and they really want to try it—that inspires me. Secondly, I want the fashion industry to improve. So I try to go global—such that it’s not just Filipinas who will wear our clothes. Everyone will be happy, and it inspires me when there’s value in everything I do. Q: Those people who patronize your clothes – do you think it makes them part of the global community? Why do you think these clothes are relevant to the global fashion scene? PS: Yes, of course. For example, if they’re wearing my clothes and they go abroad, they’re not outdated. They’re still on-trend. I also do my research, so my ideas are incorporated with what’s in right now, but just adjusted to our resources and current economy. Q: Which of your personal traits are reflected on the clothes you make? PS: I think it’s being bold. I’m bold as a person. My clothes look bold in such a way that I try something different, something new; I’m looking for new ideas, it’s always fast-paced and fast-moving. As a person I want to be updated and globally in-tune, so I want to see that in my designs. 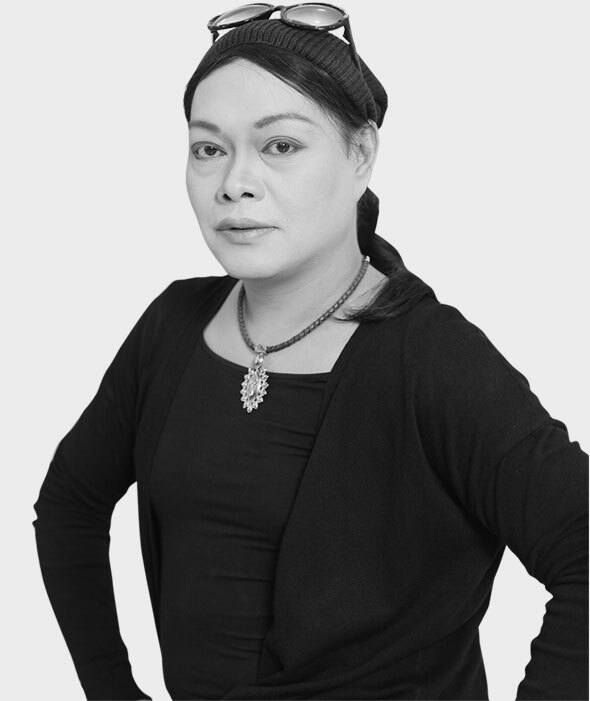 Jun-Jun Cambe (JC): The Heritage, looking over my grandmother’s picture – the baro’t saya, and not the terno – there’s so much richness in that three or four piece collection. To assemble a baro’t saya, you need a top, a camisole, a palda, a tapis; there are so many components, you just have to separate it so that it becomes now. That’s why I did what I did, separated everything and put it together to come up with a look that’s now. What’s the theme of this particular collection? What’s your personal favorite piece in your collection? JC: The theme is simple – the Filipiniana. My favourite was the opening number, the printed ones. It’s very casual, it’s eye-catching, at the same time it’s trendy and young. The camisole, the saya, the tapis – the design, I turned it into a kimono, and matched it with batik pants, the fabric of which they used as a tapis before. The idea just came to my mind. I thought a raw fabric like sinamay and pina would work well with a batik, because it’s all natural. Batik is hand-dyed, it’s not printed with machines, so it’s all personalized. Q: Why do you think these types of designs will be ideal to the summer collection/season? JC: These are very, very ideal for summer – because all the pieces are now sold out! But seriously, I think it’s perfect for summer because the material is light, flexible, and it’s relaxed. I think the look created a great airy appeal. It’s free and easy, and at the same time, it’s so simple. travels a lot. She can wear the batik bottom to her son’s football practice, and then when she needs to go to a dressier engagement, she can wear the kimono top. It’s a round-the-clock piece. Q: What was the response you have been receiving from the public? Your patrons? How do they make you feel? JC: In social media, it was a blast. In Yahoo, they posted it twice after two months. People said it was so different, so relaxed, it was very Filipino but very trendy. They didn’t expect that such a collection would emerge from the collection of designers. Basically it was something new for them. As for the clients, there were a lot of inquiries and sales – as a matter of fact, because of this collection’s feedback, I’m doing another big show. All these feedback made me feel great, and inspired me.